Property Size 1,672 sq. ft.
Our beautiful mountain townhome is located directly across from Purgatory Resort and is a perfect base for your vacation no matter the season. Shuttle access is available for those wanting to enjoy skiing, the Village, lodge amenities (workout room, pool and hot tub), dining and so much more! This unit features many upgrades and includes a gourmet kitchen with top of the line appliances, 2 gas fireplaces (Main Living Space & Master Bedroom), WIFI and washer and dryer in the unit. 3 bedroom 2.5 bath. Sleeps 6 comfortably. Living room with deck, kitchen and powder room all on the ground level. 3 bedrooms and 2 full baths upstairs. Master bedroom has a king bed, gas fireplace, TV and private balcony. 2nd bedroom has a queen bed and a TV. 3rd bedroom has 2 twin beds and a TV. Enjoy great views of Engineer Mountain and the ski slopes from either balcony or take a short walk to the community gazebo with space for outdoor dining as well as a fire pit and outdoor BBQ area (summer only). 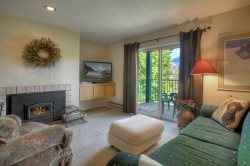 The master bedroom features a gas fireplace, TV and balcony with amazing views of Engineer Mountain. The master bath includes double sinks, standing shower, multi-head shower and Jacuzzi tub. There is a one car garage and you can catch the on demand shuttle or simply walk across highway 550 and be at the lifts in less than 2 minutes. You will have access to the Durango Mountain Club which includes an outdoor heated pool with slide, outdoor hot tub, gym and lockers. Inquire for more details. This condo is a member-home of the Durango Mountain Club, where guests can enjoy use of the swimming pool, hot tub and fitness center at the ski area base. Information about access the DMC amenities is provided to guests at time of check-in. A 30 minute drive to the south will take guests to historic downtown Durango, Colorado. This townhome is on the San Juan Scenic Skyway, which is an incredibly scenic driving loop that connects Durango, Mancos, Mesa Verde National Park, Telluride, Ouray, Silverton and Purgatory, as well as many fantastic trails for hiking, mountain biking, fly fishing and other Rocky Mountain adventures. Winter visitors will be in walking distance to the main ski runs at Purgatory while still finding themselves in a quiet condo ‘neighborhood’ with easy access and 24 hour check-in availability. In summer, there is an abundance of hiking, biking and 4x4 trails in the resort itself as well as in the San Juan Mountains which surround the resort area. Motorcycle enthusiasts will encounter completely paved roads and parking to and from the paved San Juan Scenic Byway, which offers a popular scenic drive for motorists of all kinds. Serious road cyclists with find the paved highway north to Silverton or south to Durango to be scenic and challenging routes, and mountain bikers have many choices of trails that allow bikes, and hikers are minutes from a vast array of high mountain hikes. Horseback rides and more await summer visitors, and this condo is a very convenient location to winter activities including skiing and snow boarding at Purgatory, snowmobile tours in the high country, cross country skiing, horse drawn sleigh rides and more. This condo is surrounded by tall aspen trees making a most spectacular site for fantastic views during the golden fall color of autumn. This comfortable Black Bear Townhome offers much to the traveler seeking a truly special place to call home during their visit to Durango. Contact us with any questions regarding your stay at this cozy and charming Durango getaway. It was great. Everything was a breeze. I really enjoyed my stay. I would highly recommend it to anyone staying in the area. We had a great Presidents Weekend with perfect weather. The townhouse was everything I was hoping for and was a great place to welcome friends. The team was very professional and easy to work with they gave us great information and gave us excellent instructions. The property was stocked with useful information about the surrounding area. We loved the property and everything about it. It was just convenient, it was beautifully appointed, it was clean it met every expectation and exceeded every expectation. We love it so much we thought about booking it a year in advance to come again. Emails were informational and not overwhelming in volume. New coffeemaker was brought quickly when the one in townhouse did not work. Excellent stay with clean and well kept accommodations, plenty of outdoor activities nearby, quiet property with excellent service. Marie was very helpful in communication and making sure we were ready for our visit. Everything was smooth and went off without any issues. My entire family was very, very happy with our stay. The resort across the street was a great feature for a family with kids. The area has so much to do, we only scratched the surface. I will highly recommend the property. One of our best rentals. Everyone was comfortable. We enjoyed cooking, playing games and all the outdoor activities that were within walking distance. At the last minute we were going to be arriving early to the area and I was able to book an extra night. I left a message and was promptly contacted. We enjoyed our stay and would definitely recommend this property. We had everything we needed and the selection of board games was a plus. We also enjoyed being able to use the hot tub/pool at the Durango Mountain Resort. A deposit of 25% is due at booking and the balance is due 30 days prior to your arrival date. If you are booking inside of 30 days prior to arrival then the total amount is due at booking. Please note there is a security camera located in the entry facing the front door. There are no other cameras in the home.